Yeah! I've been through that thread, great stuff. Risk games and Buck Rogers are great for dudes on a map bits. GameCrafter also has what I think are Endure the Stars character minis. I picked up a couple of battleship games to use for stat/inventory trackers. I grabbed clue DVD for the minis and maybe the cards. I got classic clue for the mansion map. Figure to maybe turn the clue board into the mansion from resident evil for a zombie plague map. Anyone know of a way to change the room pictures? I'd like to try to retheme it completely and possibly use multiple clue boards as multiple levels of said mansion. Most people who buy the deluxe version of Dread Pirate do so for the components. The game itself is a lackluster roll and move. 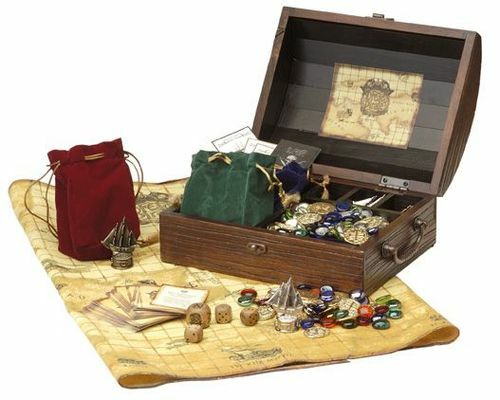 The wooden chest it comes in, the large doubloons ... paperweight like ship figurines...the quality velvet bags... all top notch.